Algebra - Matrices and Quadratics. Keep student engaged and excited with wide range of math problems. Providing unlimited math practice and solutions for K-9. Our 24/7 tutoring allows parents to reinforce classroom lessons at home and actively engage in their child's education. Various Math Topics. Printable Worksheets. Get instant access to easy-to-use worksheets, which can also be downloaded for free. Keep them busy with unlimited math lessons, assessment tests and other learning materials. Introduce your students to endless math topics and monitor their progress in real-time. Help your students work harder by recognizing and rewarding them with certificates. Provides online classroom continuing education with 24/7 access. This will keep students busy and extend learning beyond school hours. Every kind of math topic is available to learn and practice. These lessons are prepared keeping in mind the difficulty level and learning potential in students. Optimized web pages for easy viewing on phones and tablets so that users have instant access to data wherever they are. Our 24/7 math help, instant access to lessons and real-time progress reports make it easy for both students and parents to keep up with learning standards. Features a wide range of math lessons and worksheets to develop a deeper understanding and build a solid foundation of math. Focus on high-quality education and global success drives students to work harder. This translates into an exceptional experience for students as well as parents. Allan George Father of two boys, New York City. 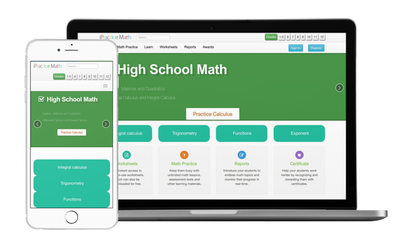 "iPracticeMath is a fantastic all-in-one stop for all things related to Math. An educator or student can find, worksheets, problem walk-throughs, and more, while tracking student progress through an educational portal." David Kapuler Blogger & Ed Consultant, WI USA. Nick Cullingham New Jersey, U.S.A.
"I find your platform well made and full of proposals. My pupils work with enthusiasm.The proposed mode of exercise promotes self-correction which I find very important.